Classic Enterprises, Mumbai Distributors for SIEMENS COMBUSTION CONTROL PRODUCTS like Siemens burner photocells, Siemens U.V. 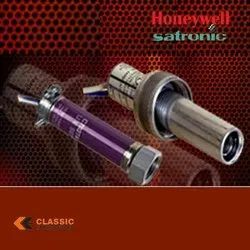 cells, Siemens flame sensor, Siemens flame detector, Siemens control box, Siemens servo motors etc..
Honeywell/Satronic flame sensors are employed to monitor the flame of an oil and/or gas burner. This flame monitoring device should be connected to a satronic oil or gas burner control box. These flame sensors detects when the flame is ignited and tends to fail safe. They have solid –state accuracy and reliability. They are dynamic self-check flame detectors for systems with long run-time. They sense flame which is difficult to sense. Satronic sensors provide mounting flexibility with choice of various models to meet variety of applications . Honeywell u v detectors are very compact in size are particularly suitable for blast tube mounting. Classic Enterprises Mumbai offering Siemens make photo cells. The flame detectors are used for the supervision of gas flames, yellow- or blue-burning oil flames and for ignition spark proving. Its wide monitoring radius and the detection even of smaller flames at long distances also make it the ideal detector for large, open-plan structures. The detectors can be supplied with or without securing flange and clamp. Different types of flame sensors are available which are suitable for Siemens burner control units. Brahma Flame Sensors different types of flame sensors like photocells, U. V. Detectors, flame electrodes, flame detection in burners occurs by means of sensors detecting the presence of flame through an electrical signal. Fc photocells are the most used flame sensors for fuel oil burners. UV flame sensors are used for flame detection in gas and mixed fuel (gas and oil) burners. Flame electrodes, ionization rod are also widely used for sensing the flame. Classic Emterprises, Mumbai offer oil and gas burnesr and spare parts. We offer Flame Sensing Electrodes. Ignition Electrodes, Flame rod, Ionization probe, Flame Sensor, Flame detctor for oil and gas Burners. We supply Spares for Ecoflam, Bentone, FBR, Cuenood, Weishaupt, Baltur and indian burners also. We offer following models of Flame Sensors Suitable for various Burner Controls. Classic Enterprises Mumbai, Distributors for SIEMENS Combustion Control Products in INDIA offers wide range of Boiler and Burner spare parts. Siemens QRI 2B2 - Infrared flame detectors for LMV51 & LMV52 Infrared flame detectors for use with Siemens burner controls, Burner Management System for the supervision of gas, oil or coal flames. This burner flame detector is suitable for any type of burners, either in continuous and intermittent operation. Weishaupt burner from Germany regularly use this Siemens flame detector model QRI B2B. Satronic ultraviolet flame detector UVZ 780, available in different variants. Looking for Flame Sensors and Phocells ?